I made this towards the end of last week, and although it was a lot of work, it was well worth the effort because it was utterly delicious. 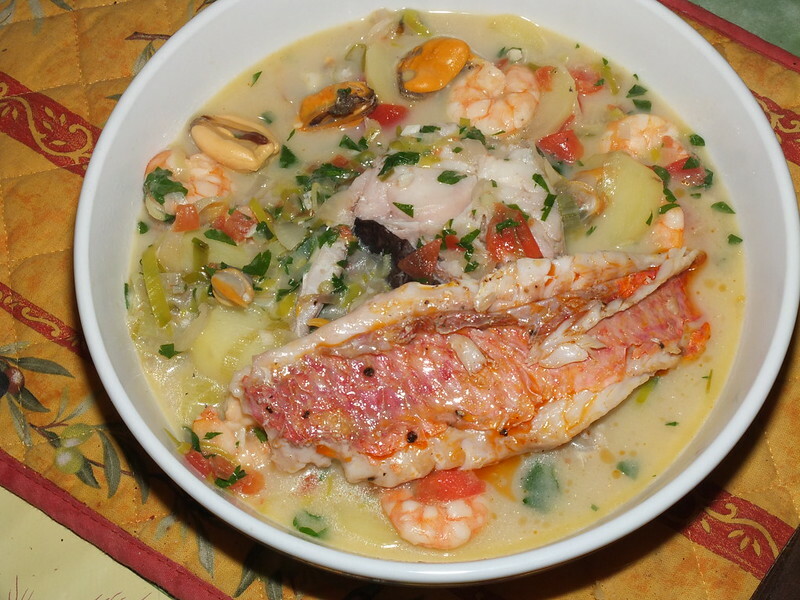 It is essentially one of those fish stews/casseroles that feature on menus all around the coasts of France. It is based on a few basic ideas that will help you make different versions of the same basic dish. First, you need a good fish stock base, which you will make using the heads and bones of the fish you will then cook in the stock. To make the stock, melt the butter in a large pot on the hob, with the oil to stop the butter burning. Add all the chopped vegetables and sauté for about five minutes. Add in the fish heads, bones and, if using, the prawn bits. Cook for a couple of minutes before adding the wine or vermouth. Allow this to bubble, add the herbs and water. Bring to the boil, skim off any scum, reduce the heat and simmer for around 20-30 minutes. Take from the heat, strain and discard all the solids. Note that you do not need to season this, because you will do this when you make the actual dish. Next, you need to cook some mussels and clams as though you were making a dish of moules marinière. This is simple stuff. Sauté some chopped onion and garlic in a saucepan, in butter. Add in some cleaned calms and mussels in their shells. Throw in a handful of chopped parsley and a glassful of dry white wine. Cover and cook for 4-5 minutes. Remove from the heat, discard any mussels and clams that have not opened. Strain off and keep the liquor and remove the mussels and clams from the shells. Throw the shells away. A variety of fish. I used hake steaks and red mullet fillets. Use what you like but avoid oily fish like mackerel. A few sprigs of fresh thyme or lemon thyme. Heat up the butter and sauté the fennel leek and shallots until soft. Add the white wine and lemon juice and bring to the boil. Add the potatoes and simmer until they are part cooked. Add in the fish, except in my case I didn’t add the mullet fillets, because I was going to cook them separately. Season with salt and pepper and simmer until the fish is mostly cooked and the potatoes are soft. This won’t take more than 5-10 minutes. Add the mussels, prawns and clams. When the prawns are pink, they are cooked. Remove all the fish and the potatoes and keep in a warm place. Heat some olive oil in a frying pan and cook the mullet fillets, skin side down at first until cooked. Raise the heat and reduce the stock slightly. Taste and adjust the seasoning. Add in the chopped tomatoes and the chopped parsley. Add the crème fraiche, stir in well. To serve, put some potatoes, fish fish and other seafood in deep soup plates, and ladle over the creamy stock. Place a mullet fillet on each plate. Serve with a bottle of chilled dry white wine, Muscadet or Picpoul de Pinet would be perfect, and crusty French bread.